Heroes are everyday people who are called upon to face insurmountable challenges and somehow prevail. Ira Hayes, a full-blooded Pima Indian, was born on the Gila River Indian Reservation, just a few miles south of Chandler, Arizona, on January 12, 1923. He was the oldest of eight children born to Nancy and Joe Hayes. Ira Hayes was a quiet, solemn little boy, brought up by his deeply religious Presbyterian mother, who read the Bible aloud to her children, encouraged them to read on their own and made sure that they got the best available education. Ira attended the elementary school in Sacaton and had good grades. Upon completion, he entered the Phoenix Indian School, where he also did very well for a while. At the age of 19, in 1942, he quit school and enlisted in the Marines, despite the fact that he was never known to be competitive or enterprising. After the Japanese attack on Pearl Harbor, he felt it his patriotic duty to serve. The Tribe approved. Ira did well in the military environment of discipline and challenge. He applied for parachute training and was accepted. James Bradley, in his book "The Flags of our Fathers," said that his buddies dubbed him "Chief Falling Cloud." Ira was sent to the South Pacific. Iwo Jima is a tiny volcanic island about 700 mi. south of Tokyo. Mount Suribachi is the highest peak at an elevation of 516 ft. It was a possible supply point for the allies and it was important to prevent the enemy from using it as such. On February 19, 1945, a large contingent of Marines landed on the island, facing an equally substantial army of Japanese defenders. One of the bloodiest, fiercest four days of combat ensued, in the course of which the Marines took more casualties than in several months of battle at Guadalcanal. This is where events took an unexpected turn for Ira Hayes. On February 23, 1945, forty Marines climbed Mount Suribachi in order to plant the American Flag on the top of the hill. Joe Rosenthal, an AP photographer, took several shots of the event. One of them became the famous photograph of the raising of the flag at Iwo Jima, the picture which soon became the universal symbol that it still is today. Joe Rosenthal received the Pulitzer Prize. The six men planting the flag in the photo were Mike Strank from Pennsylvania, Harlon Block from Texas, Franklin Sousley from Kentucky, John Bradley from Wisconsin, Rene Gagnon from New Hampshire, and Ira Hayes from Arizona. Strank, Block, and Sousley died in combat. The War Department needed heroes and these three men were chosen. They went to Washington and met President Truman. The Treasury Department needed money and initiated the bond drive. The heroes, including Ira Hayes, were paraded through 32 cities. John Bradley and Ira Hayes resented the public displays in which they were the pawns. Rene Gagnon enjoyed it and hoped to build his future on it. Later, John Bradley married his sweetheart, raised a family, and never talked about the war. Ira Hayes returned to the reservation. Whatever he saw and experienced remained locked within him. It has been said that he felt guilty for having been alive while so many of his comrades died. He felt guilty that he was considered a hero although so many had sacrificed so much more. He worked at menial jobs. He drowned his sorrow in alcohol. He was arrested about fifty times for drunkenness. On January 24, 1955, on a cold and dreary morning, Ira Hayes was found dead — literally dead drunk — just a short distance from his home. The coroner said it was an accident. Ira Hamilton Hayes was buried in Arlington National Cemetery. He was 32 years old. After John Bradley, one of the Iwo Jima flag raisers, died at the age of seventy his family discovered several boxes of letters and photographs that John had kept from his military service. James Bradley, one of his sons, wrote a book based on those documents, Flags of Our Fathers which became a New York Times bestselling book. It was made into a movie in 2006, directed by Clint Eastwood. In 2016, the New York Times published an article which brought to light some uncertainty relative to whether or not the famous photo of the six men raising the flag at Iwo Jima included John Bradley or not. A similar article was published on the same day by the Washington Post. 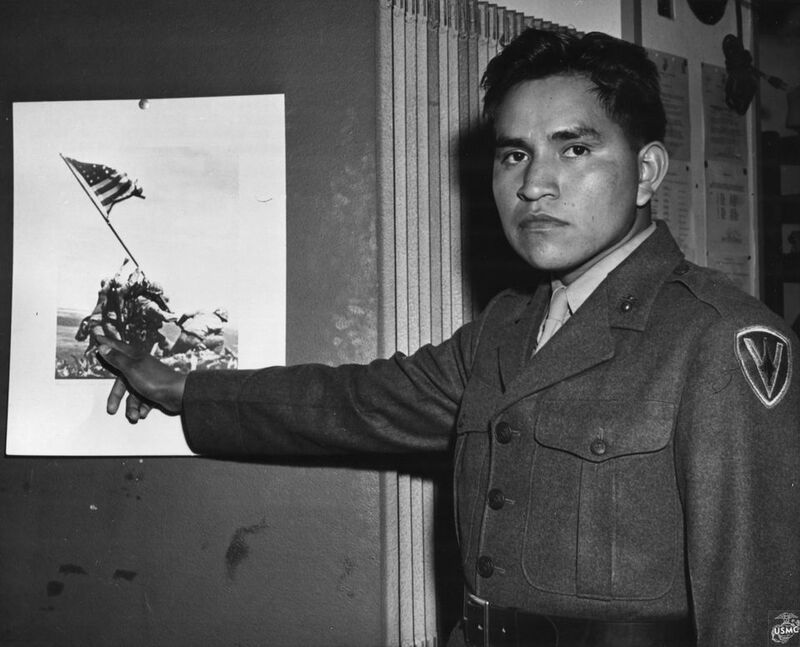 Although there may have been two flag raisings, one of which was staged, there is no doubt that Ira Hayes was one of the men who raised that flag. The Ballad of Ira Hayes was written by Peter LaFarge. Bob Dylan recorded it, but the most famous version was Johnny Cash's, recorded in 1964.